The Open Source CRM project Zurmo today announced the immediate availability of Zurmo Version 0.8.0. The most significant addition to the new release is the ability to send emails directly from within the application. This new functionality tightens communication trails associated with records in the system. Aesthetic enhancements include the option to vary the theme and texture of the application. A recent engineering improvement is the integration of Sentry, an application that allows users to automatically submit error reports to the Zurmo engineering department directly from the user interface. Zurmo users will now have the ability to send emails directly within the system. This centralizes data and eliminates the need for complicated integration tools. One of the major goals of Zurmo is to create an application that can serve as the Center of Gravity for salespeople, marketing professionals, and customer service reps. In terms of enabling users to accomplish the bulk of what needs to be done to drive revenue and keep customers happy under one roof, the most recent Zurmo releases have been significant. Visual improvements include the option to change the applications color theme and texture to match user preferences. Zurmo is the main business application used by anyone with a customer-facing function. People are logged in for hours at a time. Just as someone should have a say in the aesthetics of their physical surroundings, they should also have a say in the appearance of the software they use, states Stafford McKay, Jr., Director of Marketing and Community Management for Zurmo. If you are finding those bone-white walls to be ever more lackluster and you need a little inspiration, then go ahead, paint them mango tango. An organic element to the Zurmo Engineering ethos is maintaining Open Source software that is clean and highly conducive to further development by contributors. This goal is evident in the utilization of a strict Test Driven Development methodology and also by the elimination of bugs before they become an issue. Integration with Sentry allows users to automatically submit error reports to the Zurmo engineering department directly from the user interface. Integration with Sentry is something that our technical contributors will appreciate because they no longer need to go through the tedious process of submitting a bug report states Zurmo Co-Founder and Lead Developer Jason Green. This seamless process saves time and reduces the resistance to report issues because the effort required to do so is now significantly lower. Zurmo is looking for contributors to add code, fix bugs, and work on translations. The project is built on an honest open source model supported by a diverse community passionate about engineering the highest quality CRM on earth that people will actually use. Learn more about participating in the project: http://zurmo.org/get-involved. This entry was posted in Which Open Source Blog and tagged 0.8.0, Added, Email, Open, Releases, Source, Theming, Version, Zurmo on March 10, 2013 by Administrator. This entry was posted in Which Open Source Blog and tagged , Devices, LessonPix.com, Overlays, Releases on March 6, 2013 by Administrator. Founder and President of business consulting firm RCBryan & Associates and successful entrepreneur Roger Bryan has launched a new e-book titled Business Plan Template for a Startup Business. The electronic book has been published and can be download online from Amazon.com. This is one of a number of e-books written by Roger Bryan on small business marketing and planning techniques. This latest e-book from Roger Bryan discusses the process involved with starting a small business. The book is designed to be a guide for entrepreneurs looking for a detailed outline and step by step instructions needed for writing a successful business plan for investors, lenders and venture capital funds. The publication provides the same practical approach to business planning that Bryan and his team of business coaches at RCBryan & Associates use to guide their professional business mentoring services. The books content is based off the techniques that Roger Bryan has used to help start and develop numerous multi-million dollar companies. Bryan developed the e-book as a detailed guide for business owners who want the exact blueprint the entrepreneur used to develop the numerous businesses he has started. This entry was posted in Which Open Source Blog and tagged Book, Bryan, Business, Plan, Releases, Roger, Ultimate on March 2, 2013 by Administrator. PackFlash, developer of superior modules for the DotNetNuke WCMS (Web Content Management System), has just released an updated version of Constellation 3.2, Integrated Module Suite for DNN. This version has the capability to tie 2 or more websites together and share the content on all of those sites. Shared data can include any content put into the PackFlash modules such as news, blogs, webinars, image galleries, videos. Constellation is a combination of eight core DotNetNuke modules that are fully integrated with each other. No other module suite in the DotNetNuke (DNN) market offers this kind of integration. The modules include News & Blogs, Image Gallery, Slideshow, Friendly URLs, Mega Drop-Down Menu, Comments, Videos and Events Module for DotNetNuke. When shared, the content is treated like it is part of the new site instead of taking the user back to the original website. This is to make sure that the shared data doesnt take the user off the site that they are currently browsing, prioritizing engagement on the existing site. Administrators that have permission to see all of the sites are allowed to choose what websites can share data with each other, while website administrators have the ability to decide when to use the data from another website on their particular website pages. Version 3.2 of the PackFlash Constellation DNN Modules also offers significant functionality upgrades to the Friendly URLs Module to support the multi-site portal data sharing. This functionality includes automatic detection of duplicate content and management of the canonical version of the URL across all of the websites that are sharing content. This will provide comfort to the website owners that they will not realize a search engine penalty that might arise from duplicate content across their web properties. Additional upgrades to Constellation include a user interface improvement to the Mega Drop-down Menu Module to make it automatically detect and replace the existing menu system, administrative control of all menu settings, additional included themes, and versioning of the menus that are created. “Multi-site data sharing is a huge time-saver and greatly improves coordination for mobile site and micro-site development that leverages existing content. Any website that wants a quick way to leverage all of their content on a mobile site would immediately benefit from this approach. This is particularly true for any organization that plans to use DotNetNukes new mobile features in DNN 6.1+. claims CEO of PackFlash, Chris Risner. Other improvements to the Constellation software include improved preview capabilities that follow the page/template hierarchy rules of the system, image resizing options for best fit, provided ability to specify a 404 error page per website rather, as well as many others. PackFlash is a developer of modules for the DotNetNuke Web Content Management System (CMS). Based in Chicago and founded in 2008, PackFlash produces superior, intuitive modules that push the functionality of the DotNetNuke CMS to new limits. For more information, please visit http://www.packflash.com. This entry was posted in Which Open Source Blog and tagged Allows, Between, Data, DotNetNuke, Integrated, Modules, PackFlash, Releases, Sharing, Suite, Version, Websites on March 2, 2013 by Administrator. Hannon Hill Corporation, creator of the premier enterprise content management system (CMS) for Higher Education, has released Cascade Server 7.0. The newest version of its CMS software introduces a record number of major new features designed to further empower content contributors and simplify technical processes in the software. Among other new features and improvements, this version introduces Site Clone, a feature that allows sites to be copied in their entirety in order to streamline the process of creating new sites; Modules, a strategic new initiative to offer more components that end users without technical expertise can easily set up to generate dynamic content; and a Spectate Connector, which allows users to access forms built in Spectate and insert them into pages in Cascade Server via a button in the WYSIWYG editor toolbar. Site Clone allows users to copy all of the content of entire sites, including navigation and administration assets. Links contained within assets of a site will be re-aligned in the site copy to point to the corresponding assets within the copied site. These and other improvements to the existing site copy functionality will make it easier for customers to create new sites from existing template sites. Site Clone is going to be a game changer for templating out entire Sites, said Charlie Holder, Sales Engineer for Cascade Server. Bringing new departments and organizations into Cascade will be as simple as starting the copy routine. The introduction of modules represents a strategic shift in how end users create content for their websites. Starting in Cascade Server 7.0, end users will be able create dynamic content feeds and other modular components that would have historically required more technical expertise to create. Hannon Hills module strategy was created in order to provide more out-of-the-box functionality to end users for organizations with limited IT resources, while still allowing full customization of site features and maximum flexibility. The first module that is being added to Cascade Server is a Twitter feed. It allows users to insert a feed of Twitter comments into any region of a page on their website, and it can be customized to pull in any combination of tweets and mentions for a specific account or use a general search query. Hannon Hill plans to introduce a range of other modules in future versions of Cascade Server. The Spectate forms connector is the first official bridge between Cascade Server CMS and Spectate Content Marketing Software. By offering a connector, users will have access to a much more user-friendly form builder and have the capability to insert forms directly into pages in Cascade Server using a new button on the WYSIWYG toolbar. This connector brings in Spectates extremely elegant and easy-to-use form-building tool, said Holly Wright, Marketing Manager at Hannon Hill. We see content marketing as the pivotal reason that many of our clients purchase a CMS, and our content marketing resources are a big part of why many organizations choose Cascade Server. This is just the first of many content marketing tools that we plan to integrate into Cascade Server from Spectate. Hannon Hill also added improvements to the index block rendering cache, which significantly shorten page load time within Cascade Server. Lead Software Engineer Mike Strauch stated, Im really excited about the rendering speed improvements we’ve been able to achieve with the new caching framework. It’s not as flashy as some of the other features in 7.0, but from a user experience perspective it’s huge. Once the cache has been filled, it will only take a fraction of the time it previously took for pages to load. Other noteworthy features include extended support for HTML5, automatic unpublishing of assets upon moving or renaming them, site import/export, database export, inline regions, and an improved asset chooser with search capability. Site import/export allows entire sites to be exported from one instance of Cascade Server and imported into another instance in order to move sites into and out of test or development instances of the software. Database export allows the entire system to be exported in order to help speed up support requests. Inline regions allow non-technical users to apply blocks to pages and page types from the page edit screen. The improved asset chooser includes a new dropdown menu with historical items and search results and appears as an inline overlay rather than a pop-up window. Hannon Hills customers have been notified of the release and can download and install the new version by visiting the Downloads page online. Hannon Hill is also For more information, please see the Cascade Server 7.0 Release Notes, sign up for the June 5th Cascade Server 7.0 Feature Release Webinar, or visit HannonHill.com. Located in Atlanta, GA, Hannon Hill is the creator of Cascade Server, the premier enterprise content management system for higher education. Designed with colleges and universities in mind, Cascade Server gives higher education, government, technology, healthcare and nonprofit organizations the freedom to manage their web presence with ease and cutting edge technology. It is engineered for any network environment, provides a content contributor-friendly interface, and provides deployment flexibility, robust multi-site management and a fast implementation. Since its founding in 2001, Hannon Hill solutions have been utilized and trusted by over 180 higher education organizations including Emory University, The College of William and Mary, Northwestern University, University of Saskatchewan, and Texas A&M University, among many others. For more information about Hannon Hill and its products, please visit HannonHill.com or contact the company directly at 800-407-3540. This entry was posted in Which Open Source Blog and tagged Cascade, Hannon, Hill, Releases, Server on March 2, 2013 by Administrator. Exa Corporation, a global innovator of fluids simulation solutions for product engineering, today announced the latest release of its PowerFLOW product suite, Release 4.4. 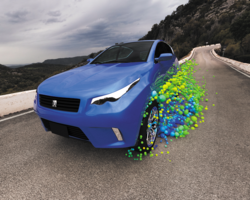 With nearly one hundred enhancements, this release significantly improves performance and user productivity, streamlining its industry-leading fluids-analysis simulation process. Overall turnaround times are reduced with performance improvements, new incremental discretization technology that accelerates automatic fluid grid creation for modified models, application-specific case setup templates for thermal and aeroacoustic analyses, and dozens of other changes designed to make analysis of complex problems faster and easier. Our customers are already running large numbers of simulations with PowerFLOW to meet their product development requirements, commented Chuck Alexander, Exas Director of Product Management for Simulation Products. Many customers are now using design space exploration and optimization techniques early in the product development process to gain rapid insight into complex design behavior. This is driving the need for an ever faster and more automated simulation process. PowerFLOW 4.4 provides a more efficient process with new automation capabilities and performance improvements in almost every step of setup, simulation, and analysis. Many thermal analysis improvements are also included in this suite release. Highlights include a new thermal battery model in PowerTHERM, which enables accurate simulation of the complex thermal and electrical behavior of batteries as well as an improved human comfort model that extends thermal simulation capabilities to include the heat transfer due to evaporation, condensation, blood flow, and sweat. This entry was posted in Which Open Source Blog and tagged Analysis, Capabilities, Design, extended, Improves, PowerFlow, Process, Reduced, Releases, SimulationDriven, Suite, Thermal, Time, TurnAround on March 2, 2013 by Administrator. MySafetySign.com has released new crane signs as safety tools for construction workers and operators. Many of the signs are instructional tools on how to operate cranes. Cranes are precarious pieces of machinery that require exercising the utmost caution. Crane accidents cause tragic fatalities every year. According to hg.org, the US Labor Department released a survey stating that at least 80 people per year die from crane-related accidents, the majority of which are caused by human error. OSHA updated safety guidelines for crane accidents in 2010, ensuring that crane safety remains a topical issue. MySafetySigns signs are innovative in design and intent. The new Crane Hoist Warning Signs indicate the proper hand signals for construction workers to direct cranes. The pictogram of a construction worker making each signal visually reinforces the proper procedures. Hands are important in many of our safety signs because they are evocative. The new crane signs help prevent miscommunication by reminding workers what the respective signals mean, said Rivka Fogel, Manager at MySafetySign. The selection of Crane Signs includes Danger and Caution signs for blaring messages to stay clear of swinging cranes. Passersby must stay away from cranes operating overhead and clear of the crane swing radius. If MySafetySign does not have the specific sign desired, custom options are available. Simply enter text, upload a company logo or graphic and have it tweaked at no extra charge, and the sign will be ready to ship in minutes. During the process of composing signs, MySafetySign takes great care in using durable materials that last for at least a decade. Aluminum, plastic, and vinyl are all hefty and affordable materials commonly used. Additionally, hard hat labels specifically for cranes are designed to adhere firmly to surfaces and also be removed cleanly. Like signs, the labels are customizable. MySafetySign is the Webs largest store for safety signage. The companys mission is to make signs and labels as effective as possible in order to prevent accidents and save lives. Customers can choose from over 40,000 designs and customizable templates. This entry was posted in Which Open Source Blog and tagged Crane, MySafetySign.com, Protect, Releases, Signs, Workers on February 28, 2013 by Administrator. One Stop Green releases its new online tool that allows users to create and manage their own green projects. The green project manager provides tips, tools, products, budgeting templates, and even financial options to show the full costs and savings that should be considered in any green project. The Energy Savings Calculator takes a users location plus data on sunlight, rainfall, and wind speed to calculate how much energy a user can generate from renewable resources. By putting in your average monthly electricity use, desired efficiency, and the cost of your electric bill, the Energy Savings Calculator will display your expected annual savings. In addition, the Energy Savings Calculator can display how much energy you will save by switching from incandescent bulbs to more energy efficient bulbs as well as calculate your potential wind and water savings. After creating a project profile with One Stop Green, where you answer questions about your property and outline what your goals are, climate data and other inputted information is displayed on the Green Project Page. Users are easily able to download templates, budget sheets, and other tools and resources and even schedule an energy audit or ask an expert should they have any questions. Take your Green Project a step further by first completing a free energy audit of your home via the One Stop Green mobile app. Download the app and select the Conduct an Audit section to name your project and do a complete energy audit of your home. Once you answer all the questions and complete the audit, you receive your Green Score that tells you how energy efficient your home is in a easy to understand format similar to a nutrition label. There is also a link to related Green Solutions and products on the One Stop Green website to help you identify problem areas and find solutions to address those problems and save money and energy. This entry was posted in Which Open Source Blog and tagged Allow, Create, Green, Manage, Online, Projects, Releases, Stop, their, Tool, Users on February 27, 2013 by Administrator.